Daisy Ridley wants us to believe that her character Rey might not become a Jedi in Star Wars: Episode VIII. But a recent photo shared by co-star Mark Hamill suggest that Luke Skywalker takes Rey under his wing as his Jedi Padawan. Leaked script details also tease that Rey will be undergoing some sort of Jedi training, and this includes becoming more proficient with a lightsaber. Today, we get to see some of these new lightsaber skills in action. Daisy Ridley has been sharing workout videos on her personal Instagram page. And the most recent one is pretty exciting. She shows off some of the moves she's learn under the tutelage of veteran stunt performer Liang Yang. You might know him better as the Stormtrooper who set off a wave of memes this past December shortly after The Force Awakens hit theaters. He is known as TR-8R by fans. In officially Star Wars lore, he is FN-2199, nickname Nines. 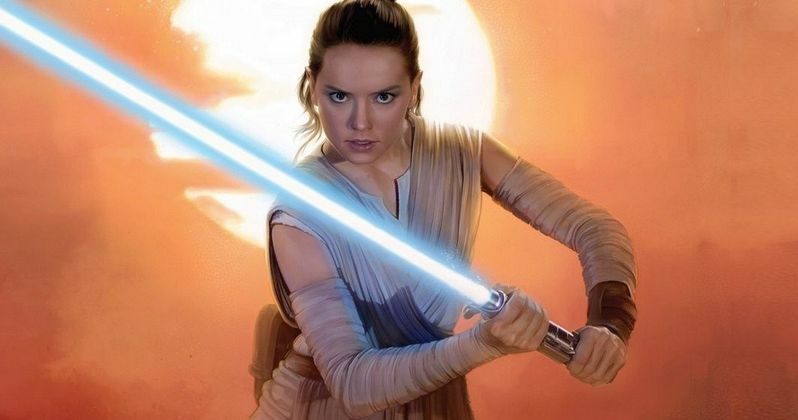 Here's what Daisy Ridley has to say about her recent lightsaber training. "So @liangstunts (TRAITOR) is WUSHU FRICKING MASTER and I always try to get him to teach me things... This was today!!! Obvs not great but HE'S amazing and he's also featured at the end ߘİߘİߘ our stunt team are the most incredible group of people, so lucky I get to train with them!" Star Wars: Episode VIII will apparently be incorporating some Wushu moves into Rey's lightsaber prowess as this latest set video attests. Wushu is both an exhibition and full-contact sport developed in 1949 to standardize the practice of traditional Chinese martial arts. The term itself is Chinese for Martial Arts, and consists of the taolu (forms) and sand (sparring} principles. Modern wushu competitors train in aerial techniques and traditional Chinese boxing and wrestling methods. Last week, a story broke reportedly revealing Rey's insane backstory in Star Wars 8. Though, none of it has been verified. Even if true, we probably won't know until the movie hits theaters next Christmas, as her true parentage is on par with Luke's discovery that Darth Vader is his father. If you really want to know, a google search will give you the answer but we're not revealing it here. In the movie, it is said that Rey will learn how to properly wield the force and use her lightsaber. You can see that last part is at least partially true in this latest video from the set.